If you’ve read many posts on this blog, you know I’m a big fan of printable miniatures from David Okum of Okumarts. David’s line at DriveThruRPG and RPGNow includes dozens of sets of first-class cardstock minis, covering genres from fantasy to science fiction, steam punk to post-apocalypse, superheroes to wild west, Cthulhu to manga, and much more. Most Okumarts miniatures sets include a dozen or more figures with several color variations. At less than $2.50 per set, Okumarts’ miniatures are an amazing value. But you may not have known that David has also released a few sets specifically associated with 5th Edition D&D through DriveThruRPG’s WotC-sanctioned sister site, DMsGuild. Two of those sets present the Okumarts take on classic D&D monsters, Mind Flayers and Flail Snails, and are available year-round as Pay What You Want products. During the Christmas in July sale, though, I strongly recommend you pick up Okumarts’ 5e Fighters and 5e Orcs & Goblins sets. Because Wizards of the Coast takes a cut on all sales on DMsGuild, David has to charge a bit more than his regular $2.45 per set for these, but the 25% Christmas-in-July discount brings them down to $2.44. As he does in several of his player character sets, David populates the 5e Fighters set with male and female versions of six distinctive warriors. Their weapons, armor, and ethnicity vary widely, consistent with the welcome cultural diversity among player characters presented in the 5th Edition D&D Player’s Handbook. The artwork is up to David’s usual high standards. Naturally, these figures will work perfectly well with any fantasy RPG, despite the “5e” connection in the set’s title. The set’s bonus page adds several more minis to the collection. A young squire—in both male and female versions—evokes young Wart in Disney’s classic The Sword and the Stone. The teen-aged archers—again, in male and female versions—remind me of Christian Slater as Will Scarlet in the generally forgettable Kevin Costner vehicle, Robin Hood: Prince of Thieves. Three persons-at-arms (one woman, two men) in matching livery make excellent castle guards or gatekeepers. The bonus page is rounded out by a trio of target dummies, ready for weapons training. As usual, David takes advantage of PDF layers to add color variations to all the minis, offering 11 versions of the main fighters page, and eight versions of bonus page, allowing you to print out over 100 unique minis from this one set! If you’re a fan of Okumarts minis in general, but not so hot on the old-school, pig-snouted orcs in David’s Darkfast Classic Fantasy line, the 5e Orcs and Goblins set is exactly what you’ve been waiting for. The orcs in this set are gray-skinned body builders, with pointed ears and protruding tusks, just like the ones in the official 5e D&D books. The goblins follow the WotC standard as well, presented as oranged-hued savages with beady eyes, big noses, and lots of pointy teeth. The main page in the set offers five orc warriors (three with melee weapons and two archers) and six goblins (four melee fighters, two archers). The set’s bonus page includes three more orcs—one more warrior, a female rogue-type dual-wielding hand axes, and an orcish warlord with plate armor and a magic battle axe. It also offers six more goblins—three additional warriors, and three sneakers (one male, two female) dual-wielding knives. A lone hobgoblin is included on the bonus page, presumably to push the goblins around, but he can pass as orc if you don’t look too close. The color variations on the PDF layers in this set let you mix and match five skintone variations (including Orgrimmar green for Warcraft devotees!) with six wardrobe color schemes. With 30 possible color combinations across 21 distinct figures, that’s over 600 unique miniatures from one $3 set! Try to find that kind of value in plastic or metal! Christmas in July at DMsGuild, too! While you’re picking up David’s 5e mini sets, browse around the rest of the DMsGuild website. The Christmas in July sale is in full force there, too. Now’s a great time to pick up any official D&D PDF products you’ve been pondering, especially if you’re into earlier editions of the game. There are literally thousands of classic TSR and WotC sourcebooks, supplements, and adventures at 25% off, along with some amazing WotC-sanctioned content from the D&D community. 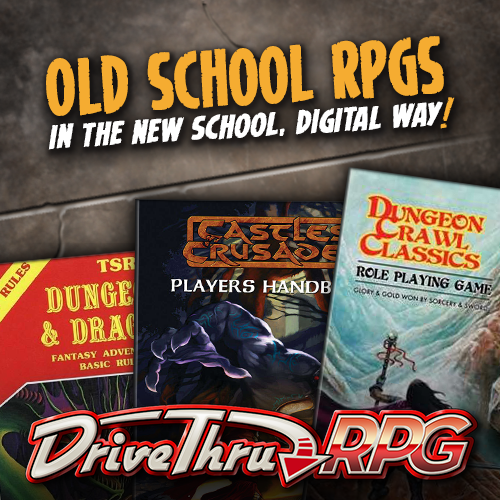 This will be your best chance to pick up authentic D&D material for quite a while! Happy X-mas hunting, and until next time…keep on printing, and keep on playing! Thank you! I have been a fan of okumarts for years and have picked up most of his sets including some in this sale but never realised that there was different sets on DM Guild, i just assumed it was another drivethroughrpg or wargamesvault and since Hero Kids is the closest I get to playing D&D in years I have little reason to go on there. Looking forward to picking them up and spending a bit of time looking around DM Guild. Keep up the good work promoting products that might be lesser known and best of luck with the house move. Thanks for the encouragement. Pointing out great products that may have escaped folks’ notice is one of the main points of this blog, actually, so I guess it must be working, to some degree at least! I was just discussing with David (Okum, of course) at the Cardboard Warriors forum how little overlap there seems to be in the audiences at DMsGuild and DTRPG/RPGNow. DMsGuild is very focused on D&D 5e these days, while DTRPG/RPGNow is much more about products from indie publishers, both of OSR games and new systems. Not very many people seem to be shopping in both of those markets, so its easy to overlook something on the site you don’t normally visit. This is true of WargamesVault to some degree as well, though I sense that there’s a bit more overlap between the interests of wargamers and OSR/indie gamers than there is between wargamers and D&D purists.